Jeff Parker joins the studio. 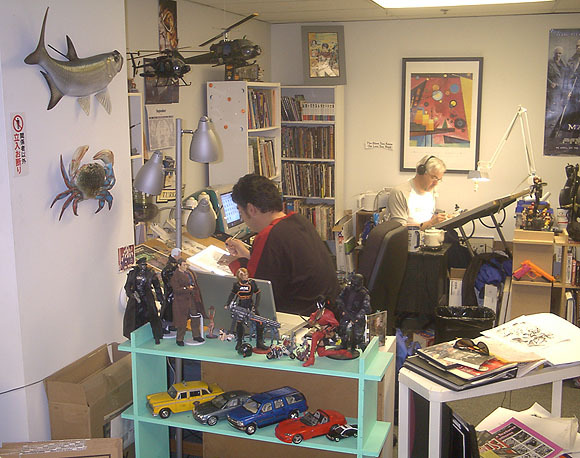 Above: Paul Guinan defends his turf against the encroachment of the studio's new member Jeff Parker. Luckily, Jeff can't aim worth a damn! Right: Our resident blogger Steve Lieber drags himself away from the Internet and spends some time drawing (despite the deafening gunfire). His area continues its evolution into a full-blown natural history museum. 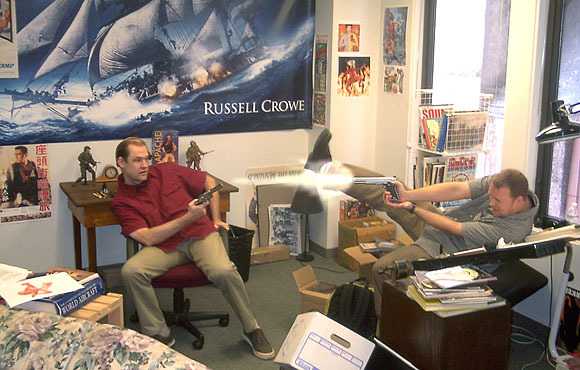 Below: David Hahn and Ron Randall demonstrate good work ethic. David's auto collection reveals he has investments in Corgi and the Franklin Mint. Actually, the toy cars are great reference. Look for these vehicles in David's work.